they had listed on clist/portland oregon for 1000 less, fwiw.... Looks great! Yes, those are '88 and up door moldings. You sure about that ?? Interesting. They weren't on the Camaros until '88. Good to know! I just learned something. Last edited by chazman; 12-16-2018 at 11:03 AM. Now that's my idea of a Trans Am, not dated two tone. 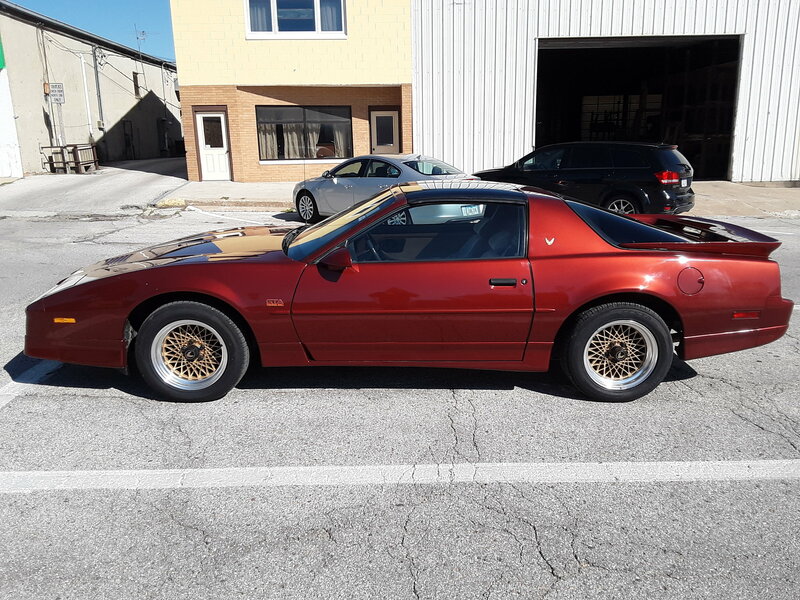 My brothers 50k mile 87 GTA has those moldings as well....and all original. What's the difference between those wheels and the wheels on your recent formy BJT? ...I mean I can SEE the difference, but what's the significance? BTW I LOVE two tone.....but not on red. 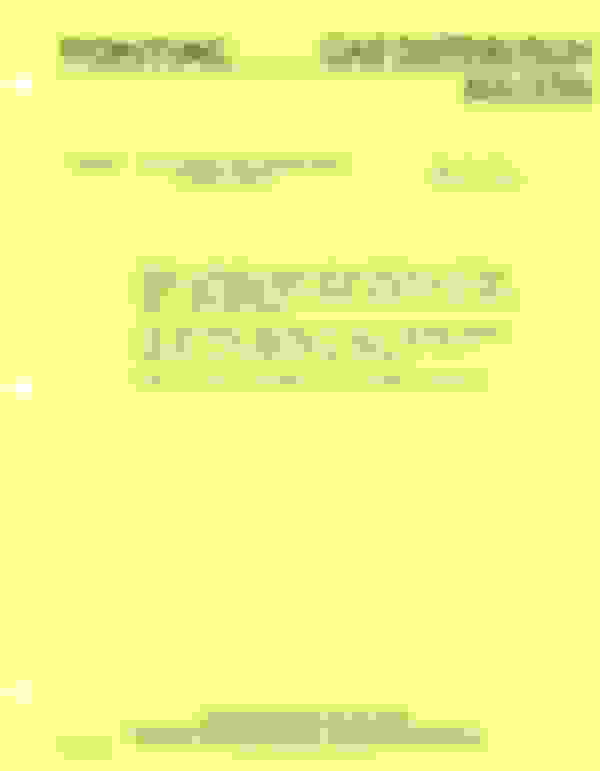 Last edited by BizJetTech; 12-16-2018 at 12:04 AM. The convex wheels are HEAVY. The concave wheels were a touch lighter and look more aggressive. The GTA style wheels were the lightest. The convex 20-slots date back to the 84 Trans Am 15th Anniversary edition. That makes them the first 16" wheel on an F-body, beating the Iroc to the punch. By 87 they were pretty dated, definitely due for an update. 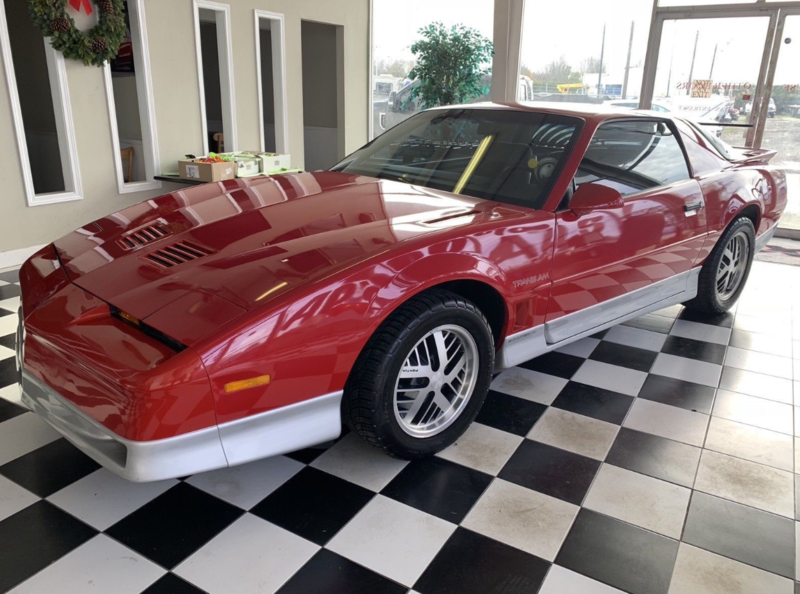 The swan song was on the 87 Formula, then in 88 the Formula got the new deep-dish wheels, and the Trans Am got the GTA style wheel when equipped with 16" wheels. Funny I never noticed or didn't remember that Firebirds got the fat moldings in 87. 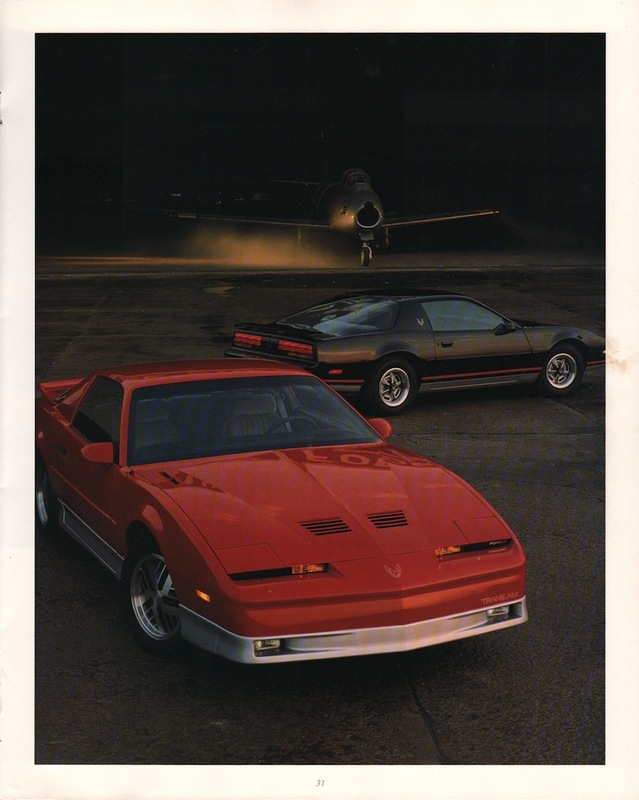 They're even pictured in the 1987 Pontiac brochure. Going off what Drew says makes you wonder, on Frank Rider's site, there was an interview with Lou Wassel. He stated that the cross lace wheels were used not for aesthetics on the GTA but to avoid fuel economy penalties. Due to the weight of convex wheels affecting the total weight of the car and incurring some potential weigh/fuel economy penalties. 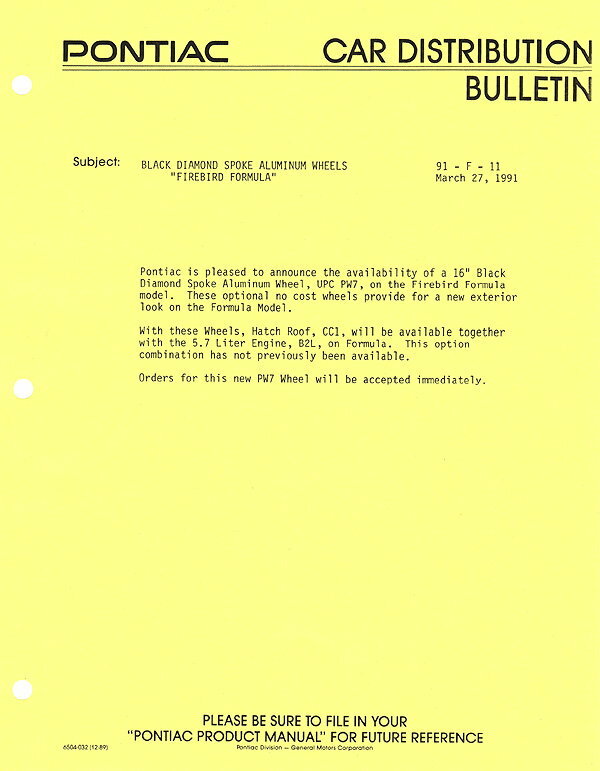 Then this bulletin from 91 which seems almost a veiled attempt to offer a new "appearance," but really maybe use those cross lace wheels as opposed to the concave Formula wheels to avoid fuel economy penalties due to the added weight of T-tops. All conspiracy theories at this point, but it makes you wonder if those wheels suffered their fate due fuel economy/vehicle weight than anything else, or were more cars optioned one way as factory orders for that purpose or possible cost of one wheel versus the other. Who knows. Originally I was heading that direction in my last reply, but it got edited out to avoid steering too far into conjecture. The following is intended as entertainment only. The names and places have been changed to protect individual privacy. Any similarity to real people or autos is strictly unintentional. The views expressed are not necessarily the views of the author, or this website. Draw your own conclusions at your own risk. 1988 seems like a crunch year for weight reduction. 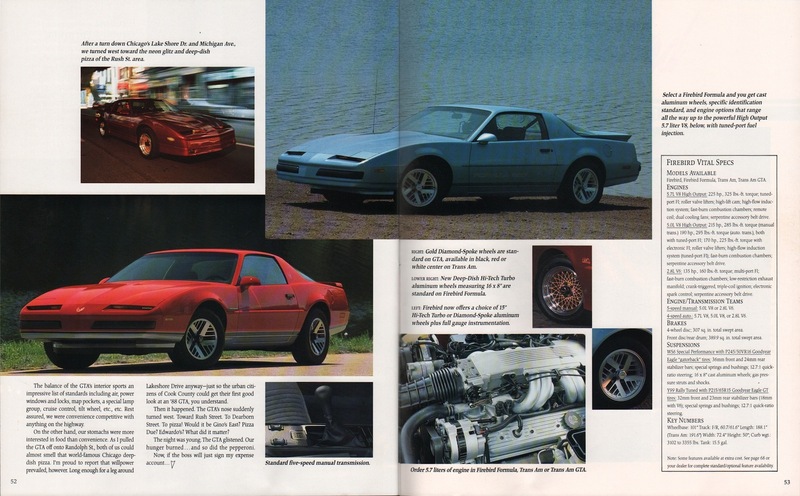 In 88 & 89 there were a bunch of Trans Ams and Irocs with aluminum driveshafts for no obvious reason beyond weight savings. The examples being cars that weren't G92 cars. There are other hints towards weight being a significant issue, but it borders on conspiracy theory. It's not something that is spelled out, and obvious, it's more of reaching a logical explanation based on circumstantial evidence. For example a person could look at some of the restrictions of the big brake package (#1 Limited Edition), the characteristics of those cars, as being less pertinent towards increasing race performance, or discouraging potential buyers, but rather to compensate for a less efficient drivetrain and the greater weight of the dual piston brakes. No fog lights, no side moldings, no A/C, is it really to improve airflow through the grill? Or is it to keep the car from becoming porky and impacting CAFE? A person just doesn't want to get into discussing that kind of idea, since it lends itself to being misinterpreted and leading to a debate. Is it all connected? Or was it a tag team effort between the ancient aliens and Bigfoot? You be the judge! The debate aspect comes from enthusiasts who feel it's the bean counters at GM who negate their delusions from coming to fruition. More than likely as was in '88 and as is now, you had an engineering team/marketing working within bounds of every changing federal regulations and budgetary constraints in order to achieve some purpose. Configuring certain options packages and using parts to reduce the average weight, few lbs helps when looking at building thousands of these cars. Very typical decisions that are still made today, average weight reduction by using this part, CAFE reduction by building X engine to B engine ratios to meet certain incremental increases, average cost saved by using this clip, etc. We look back and it's fun to make it some thing it's really not, which is probably some guy analyzing back in 1988 dot matrix prints outs that spanned 3 city blocks. All this car needs is a set of Hawks 17in black crosslace wheels. Very nice car id love to have it. I think "looks decent" in an understatement. Honestly, I think $9K is a steal if this car is as good as it looks. The low price would make me wary of buying sight-unseen. Very nice car.. I agree with dmccain.. the cross lace wheels would make it look less dated.. I almost like how vintage the car looks with the two tone.. The stick shift would be fun to have.. I've often found that dealers are incredibly unresponsive to questions submitted online. They would be smart to respond in a hasty manner to BlizJetTech if they knew how many of these cars he buys! If you are a dealer, you only have one job. Selling cars. I just don't understand why it's such a burden for them to respond to questions or send additional pictures. Garage find 1982 Trans Am 41K miles ! !